The classical method of epimerisation, the Lobry de Bruyn - Alberda van Ekenstein rearrangement has been treated by S. Angyal, the expert in the field of free sugars and their interconversions. L. Petruw and co-authors have contributed a first-hand experience based chapter on the B�lik reaction, which was discovered in Bratislava and is an important approach to rare sugars on a commercial basis. Another, more recently developed method, the epimerisation of free sugars catalysed by nickel (II)/ethylene diamine complexes, has been reviewed by S. Osanai. Robin Ferrier, the discoverer of the allylic rearrangement of glycals (generally known in organic chemistry as the "Ferrier I" reaction) as well as of the transformation of hex-5-enopyranosides to highly functionalised cyclohexanones (coined "Ferrier II" reaction) has provided accounts on these milestones of carbohydrate chemistry. A chapter on base-catalysed transformations of aldonolactones has been provided by I. Lundt, the leading expert in this area, in collaboration with R. Madsen and an account on Claisen rearrangement reactions in carbohydrate chemistry has been contributed by B. Werschkun and J. Thiem. From the Graz groups, K. Dax and M. Albert have gone through the efforts to categorise rearrangements occurring during (attempted) nucleophilic displacement reactions at various ring positions in monosaccharides. T. Wrodnigg and B. Eder have reviewed the Amadori and Heyns rearrangements. In addition, a contribution on d-xylose isomerases and related, preparatively useful enzymes some of which have been used in this laboratory has also been included. A short section on reactions related to the general topic under consideration but not treated in the other chapters in this book has been compiled by A. de Raadt and M. H. Fechter. 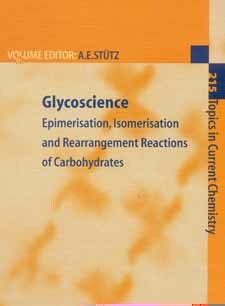 Glycoscience: Ephimerisation, Isomerisation and Rearrangement Reactions of Carbohydrates is written for industrial and academic research chemists at universities or in industry. The Amadori and Heyns Rearrangements: Landmarks in the History of Carbohydrate Chemistry or Unrecognized Synthetic Opportunities?